Immy Black in Drama on 4 December, 2015. Ooook! Productions have put together an evening of two one-act plays, both of which will, in their own ways, entertain and leave you bewildered. From the beautifully constructed programme to the lingering dead body from the first play into the second, the two pieces link together wonderfully to break down any aspect of the fourth wall you hoped might be lurking behind a slightly dodgy chair in The Assembly Rooms Theatre. The result is one of those evenings that, in six months time, will strike you as clearly as it did on night itself. The Actor’s Nightmare, by Christopher Durang, was a beautifully constructed potpourri of landmark theatre, featuring an accountant, George (Matthew Elliot Ripley), who wakes up as the lead role in a series of plays. The opening scene set the stage ‘before curtain-up’ so pleasingly that we had to wonder if something had gone slightly awry, as techies and cast wandered or rushed across the stage. Then the lights came up again and the set came alive with Claire Forster’s Amanda admonishing Elliot Ripley in a perfectly unbearable manner. Private Lives lost a little energy in the middle of the scene, but was brought back up with the entrance of Serena Gosling and the passionate argument between the three actors. Adam Simpson gave Elliot Ripley’s questions no replies, save those in 17th century iambic pentameter, in the next play of our series, Hamlet. Confusing Horatio and unintentionally spurning his Ophelia, Elliot Ripley was left to create his own soliloquy, showing vivid control of the stage and the audience. Gosling showed remarkable poise and serenity from within her bin and transformed the scene so that it feels like, in another universe, Endgame will still be going on. Of particular mention must be Simpson’s entrance as the executioner to Sir Thomas More, although one questions somewhat the necessity of his lack of upper clothing. The play built to a climax with this final scene, and the images you were left with in the interval were striking. Inventive use of minimalist set and lighting design matched with the voiceover to flawlessly capture the mood of the play. The ultimate credit must be to Elliot Ripley for his stunning portrayal of emotions (mainly confusion) which carried the audience with him throughout the play. He was slightly less comfortable with the more tragic parts, but showed moments of heart-rending hilarity and the rest of the cast joined him to make it a spectacular show. 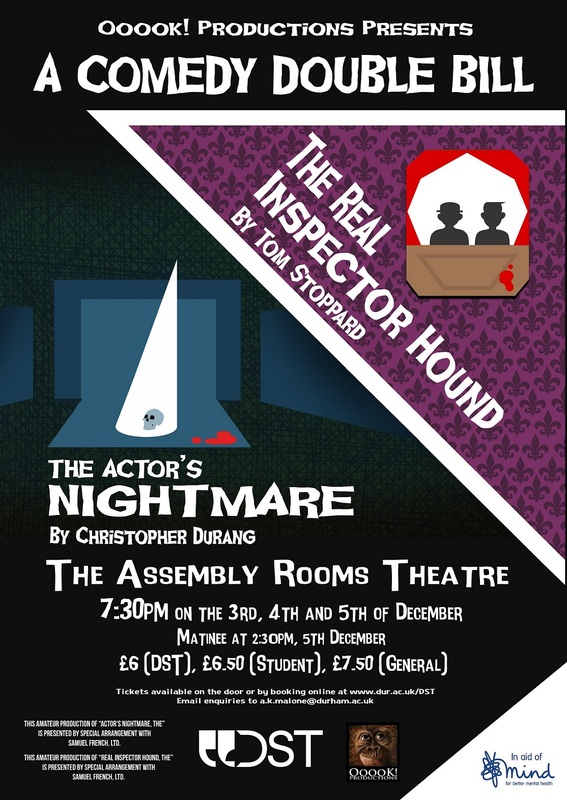 The Stoppard classic The Real Inspector Hound told the tale of two critics, Birdboot and Moon, reviewing a classic who-dunnit, with the eavesdropping maid, mad crippled uncle, mysterious corpse and the chance for everyone to act as detective. The sudden appearance of more ‘audience’ members on stage made the beginning subtly comical, and although the first part had many great lines, it seemed to be accompanied with some first night nerves. It almost seemed, when listening to the critics in the play, that they were doing my job for me, down to the “ubiquitous obliquity” that I found in their own lines, even as they were said with tremendous clarity. The nerves gradually abated, and by the absurdist moment Birdboot became entangled in the play itself, the cast were hitting their stride. The play centred on the critics, who were a delight to watch at cross purposes with each other, and mimicking the other actors. The cast made every distinct conversation clear, a remarkable feat with this work considering the nonsensical monologues. Abbie Weinstock tripped daintily over her gibberish, and elaborated the necessities brilliantly/ Ram Gupta, who was at first more sedate, then easy to anger, showed natural emotions in this absurdist piece. The Mornington Crescent-like game of bridge was a highlight of incomprehension. Particular credit must go to Andy White, for his spectacular accent and skill with a wheelchair, negotiating the potential on stage minefield. The Real Inspector Hound was thought provoking up to the last moment (including a mysteriously quiet gunshot) and culminated in a spectacular fashion, leaving the audience little time to absorb the ludicrous ending before it finished and bows called. Alas, I was not allowed to review this in neon letters like the on stage critics did. If you’re up for an evening of poise, brilliance and laughter, followed by slight bewilderment as you wend your way home, do take the time to see Ooook!’s A Comedy Double Bill.